This recipe is the property of DNags and released under the All The Flavors Public Domain license. You may not copy, derive or commercialize this recipe without following the terms of this license or the explicit permission of the creator. I've tried so many different recipes trying to like a watermelon vape, but for me it's always something that's only been useful as an accent note. 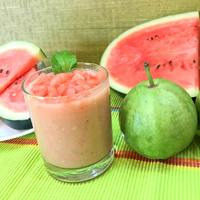 This recipe brought the melon and made it pleasant for me. Nice recipe. This is pretty decent watermelon. The guava really helps add some tartness to the watermelon. The cactus adds the wetness. I mixed a second a second batch without the meringue and enjoy it much more. Thanks You for the recipe.